These services consist of disk and file management, memory management, and device management. In other words, it manages CPU operations, input/output activities, storage resources, diverse support services, and controls various devices. Operating system is the most important program for computer system. Without an operating system, every computer program would have to contain instructions telling the hardware each step the hardware should take to do its job, such as storing a file on a disk. Because the operating system contains these instructions, any program can call on the operating system when a service is needed. 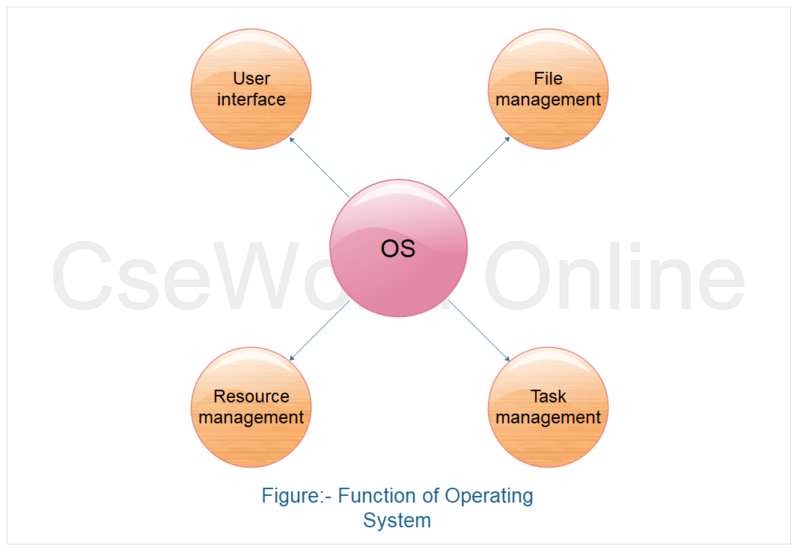 An operating system executes many functions to operate computer system efficiently. Among them, four essential functions are the followings. Resource Management: An operating system manages a collection of computer hardware resources by using a variety of programs. It manages computer system resources, including its CPU, primary memory, virtual memory, secondary storage devices, input/output peripherals, and other devices. Task Management: The function of the operating system that controls the running of many tasks. It manages one program or many programs within a computer system simultaneously. That is, this function of operating system manages the completion of users' tasks. A task management program in an operating system provides each task and interrupts the CPU operations to manage tasks efficiently. Task management may involve a multitasking capability. File management: This is a function that manages data files. An operating system contains file management programs that provide the ability to create, delete, enter, change, ask, and access of files of data. They also produce reports on a file. User Interface:It is a function of an operating system that allows users to interact with a computer. A user interface program may include a combination of menus, screen design, keyboard commands. A well-designed user interface is essential for an operating system to be popular. Because of the function, users can load programs, access files, and accomplish other tasks.